Update: The Honor View 10's price has dropped and Android 9 Pie is rolling out to the phone, but it also has new competition. We've updated this review to reflect all of this. If the high prices of today’s flagship phones make your wallet tremble, alternatives like the Honor View 10 and OnePlus 6T should have your attention. They cost half the price of an iPhone XS, but still offer high-end features and a contemporary design. Phones like this are an excellent argument for why few, if any, of us really need to spend a huge amount on a new mobile, even if we are getting more demanding by the year. There's the odd Honor quirk, and the design isn't quite as glitzy as that of the smaller Honor 10 or the newer Huawei Mate 20. But it's hard to beat in terms of pure value among high-end mobiles. Watch the video below to see more about the design of the Honor View 10. At its announcement there was a lot of talk about the Honor View 10's price. It hadn't been revealed properly, and the success of this model depended largely on how competitive its price was. The Honor View 10 cost £449 SIM free in the UK at launch, which equated to around $600, AU$800. That price makes the phone, surprisingly, a little cheaper than its arch-rival the OnePlus 5T in the UK. The Honor View 10 has 128GB of storage, and the 128GB version of the OnePlus 5T cost £499 / $559 / AU$699. Since launch the Honor View 10 has become even more affordable too, as you can now find it for around £330 / $480 / AU$710. It's hard not to love the core aim of the Honor View 10. It's out to provide much of the hardware and features of the biggest names, but at a much lower price. Sure, you don't get a brand name that as many friends will recognize, but if it saves you £300/$300, are the bragging rights really worth it? And if you must brag, you can still boast about bagging a bargain. Excellent features for the money include 128GB of storage, the advanced Kirin 970 chipset also seen in the Huawei P20 and Huawei P20 Pro, and a 20MP/16MP dual-camera array on the back that offers low-loss 2x zoom. The phone also follows the latest trend in displays with an ultra-narrow surround that makes the image appear to cover almost the entire front of the View 10. You miss out on very little of importance with this phone. Just like the Honor 9 before it, the Honor View 10 is impressive. 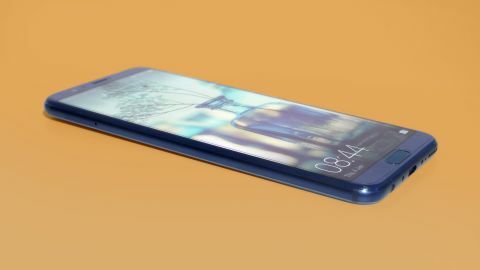 The Honor View 10 looks similar to other late 2017/early 2018 phones front-on. There's just a thin band of border around the display; like its rivals, Honor has pushed for less wasted space. It's just about the only way to make a phone with a 6-inch screen that doesn't demand extra-wide pockets. Honor hasn't tried to hide what small bits of surround exist, though. They're ultra-glossy blue in the model we reviewed, looking like the finish of last year's excellent Honor 9. The View 10's back design is totally different, though, more conservative and pragmatic than some of this phone's pricier rivals. Its rear is aluminum and, unlike the old metal iPhones, the sides and rear are separate parts. While there's some attractive beveling to the side's edges, you can imagine this style might have been used to lower production costs. Today’s phone material of choice is glass too, rather than metal. The iPhone XS uses it, as does the Samsung Galaxy S9, with aluminum seen by some as 'mid-range'. This is a slightly ridiculous notion, but those obsessed with being on-trend may disagree. The Honor View 10 is extremely thin, however. At 7mm thick it's thinner than the iPhone XS or Galaxy S9. It's so thin, you have to wonder: why? An extra 0.7-0.8mm of chunk wouldn't hurt the View 10's design much, and would allow for a larger battery and avoid the dual camera lenses sticking out on the back – as it is they look like a pair of Minion™ goggles. However, as the colored aluminum of the rear is almost certainly going to get damaged before anything else, you may want to consider a case anyway. And all of our criticisms are quibbles. The Honor View 10 is a well-made, attractive phone, and its price rival the OnePlus 5T also uses aluminum on its rear. Like the Honor 9, the View 10 has a fingerprint scanner on the front, and it's a fantastic one – it's so fast you can barely believe it's actually scanning your digit, and it's a joy to use. Dig into the Settings menu and you can also use the scanner to replace the on-screen home keys. We wouldn't recommend this to most, though, as the slim surround design leaves virtually no breathing room between the scanner and display. Look on Honor's website and you'll see it promises Face Unlock as a View 10 feature, but it wasn't here when we reviewed it, instead arriving later as a software update. What we had at review is something rather more unusual. You can teach the phone your facial geometry and it'll blank out the notification details on your lock screen until it recognizes your face with the front camera. This is a neat idea, a less critical way to implement facial recognition more simplistic than the iPhone XS's, although we've found it struggles to recognize faces in dim indoors lighting or under high-contrast lighting. And you can't see your notifications unless you're looking at the display dead-on. One of the few obvious hardware sacrifices of the View 10 is water resistance. The phone has no official water resistance, although we'd hope there's a degree of water protection in the charging port. It's worth noting though that the Huawei Mate 10, a similar but more expensive phone, also lacks water resistance. There are also some ways in which we're glad the View 10 hasn't followed the 'trendy' flagship crowd. There's a headphone jack where several of the most expensive phones have rejected them (for no obvious benefit), and despite the phone having a huge 128GB of storage you can still add a microSD card – the SIM tray has a slot for one. The Honor View 10 has a 5.99-inch IPS LCD screen, with a stretched-out Full HD resolution of 1080 x 2160. This display is similar to that of the OnePlus 5T, except that it uses an LCD panel rather than an OLED one. The difference? OLEDs tend to have richer color and always have better contrast thanks to their light-emitting pixels, but LCDs can look sharper than an OLED of the same resolution, as most OLED panels in phones use 'shared' sub-pixels. We'd suggest not getting too hung up on the differences here, though, because the quality of the Honor View 10 minimizes their importance. Colors look great, the display is sharp despite having far fewer pixels than a Samsung Galaxy S9, there's barely any brightness loss from an angle, and contrast is excellent. At an angle, in a dim room, you can see the backlight luminescence, though, and fresh out of the box the View 10's colors are a little hot, typical of the standard screen calibration of any high-end Android. However, if you like a more relaxed tone you can switch from Vivid mode to Normal in the phone's display settings. Like other Honor phones, the View 10 also has a color temperature wheel that lets you make the screen appear warmer or cooler, or give it a (slightly) more specific color skew. As this will probably be your first phone with an ultra-narrow screen surround, though, it's the shape of the View 10's screen that's one of the most important elements. This doesn't feel like a 6-inch screen because it's only really longer than the norm, not wider. It feels more like an ultra-widescreen take on a 5.5-inch phone. This is no slight, though. Games look great on the View 10's screen, as do cinema-aspect movies.